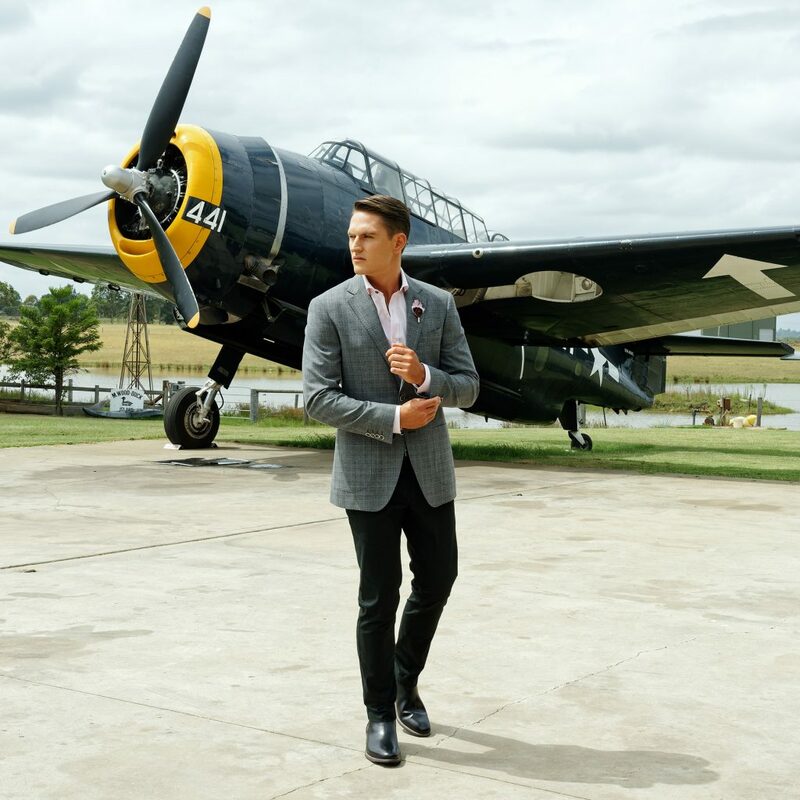 On a sunny day last week, our dedicated team travelled with us to Luskintyre Airfield in the Hunter Valley to put together this amazing photoshoot, showcasing the latest styles from a wide range of brands, surrounded by vintage planes and against the backdrop of the beautiful Hunter Valley wine country horizon. 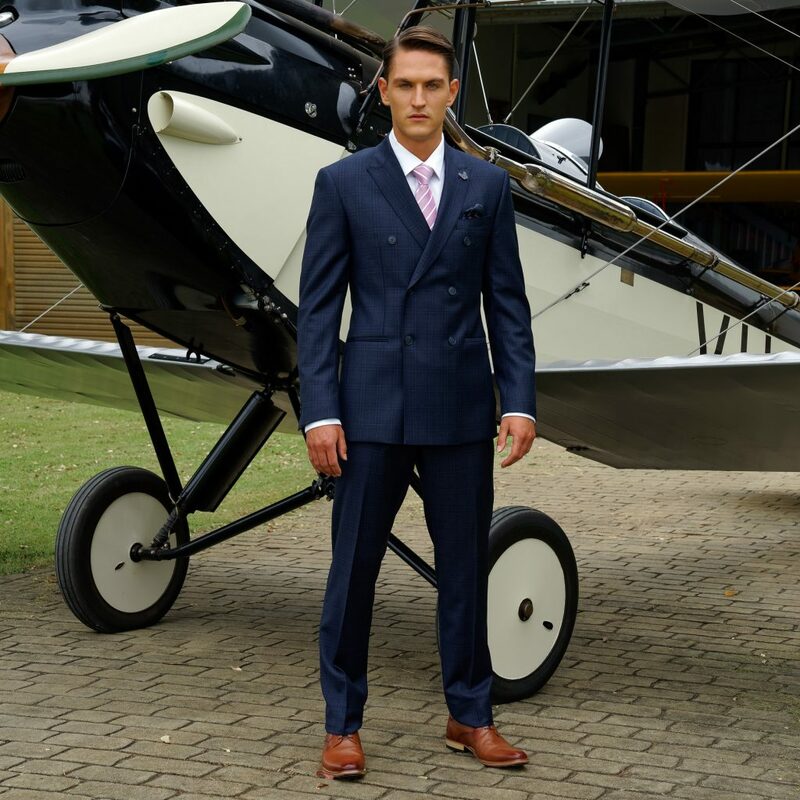 The airfield was established in 1977 and is a 228 acre, privately owned property with the aim of preserving and operating vintage aircraft and made for a stunning backdrop to The Luskintyre Collection. Keep reading to see our 2019 Men’s Trend and Style Guide featuring bold checks and new season blues, strong double-breasted linen and wool suits, monochromatic ensembles, intriguing accessories and casual looks. Make your next style move with a bold window pane check. From the boardroom to the red carpet or the races, bold checks can carry you through from day to night in any event. 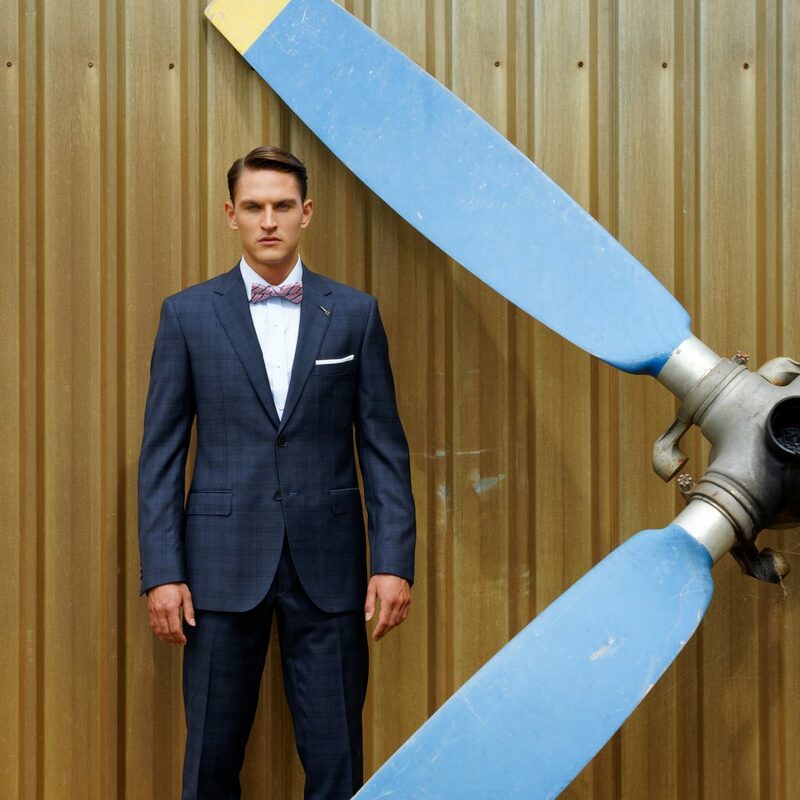 Modern check suiting has a vintage elegance to it that is both contemporary and traditional. 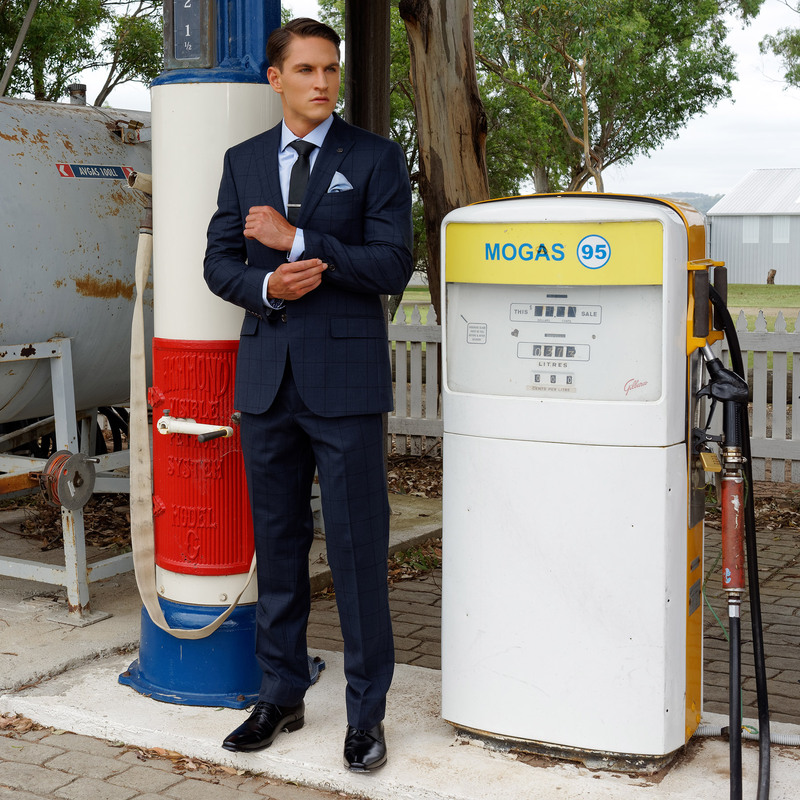 Blue has always been a popular choice of colour when it comes to suiting as it’s versatile and suits most skin tones. This year we are still seeing this blue trend, but featuring new shades and checks. The Cambridge window pane suit shows off teal, a new take on blue, featuring teal with a black window pane check, while Pierre Cardin knows you can’t go wrong with navy, but makes a statement with a subtle pink window pane check on their new suit. Liam wears Pierre Cardin navy and subtle pink check wool suit and Wolf Kanat pink shirt with Hardy Amies Navy Vespa tie, Ferracini Tan Shoes and Buckle Belt in Tan. 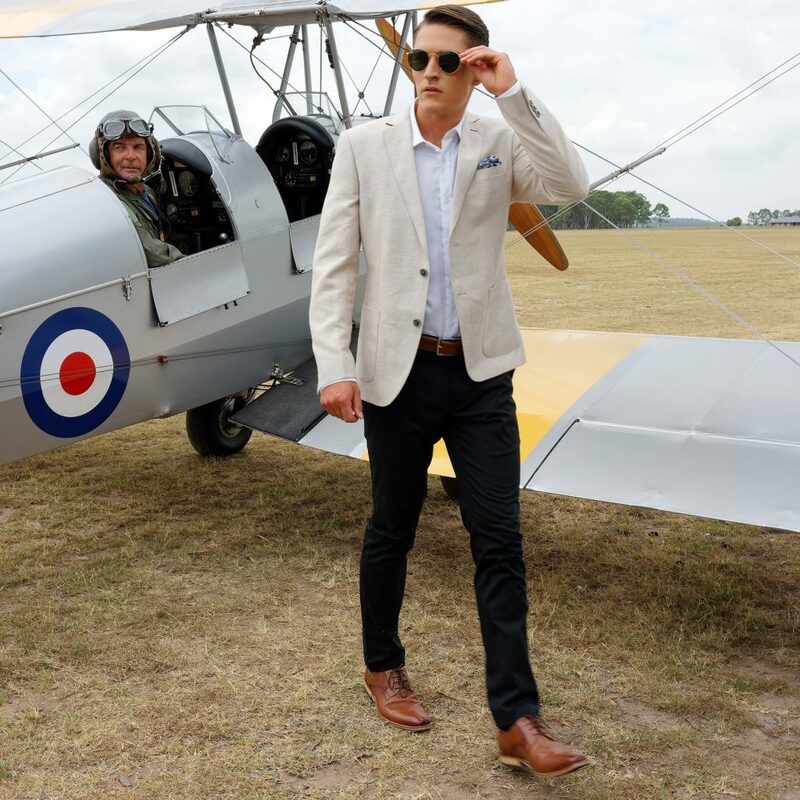 Liam wears New England Tommy blue window pane linen sports coat, New England white chino and John Lennon pale blue textured shirt with Buckle Belt in black and Ferracini black shoe. Liam wears Cambridge teal and black window pane check suit and John Lennon pale blue textured shirt with Louis Cheval black textured tie, James Harper blue textured pocket square, Geoffrey Beene Gunmetal tie bar, Florshiem Dalton black shoes and Buckle Belt in black. 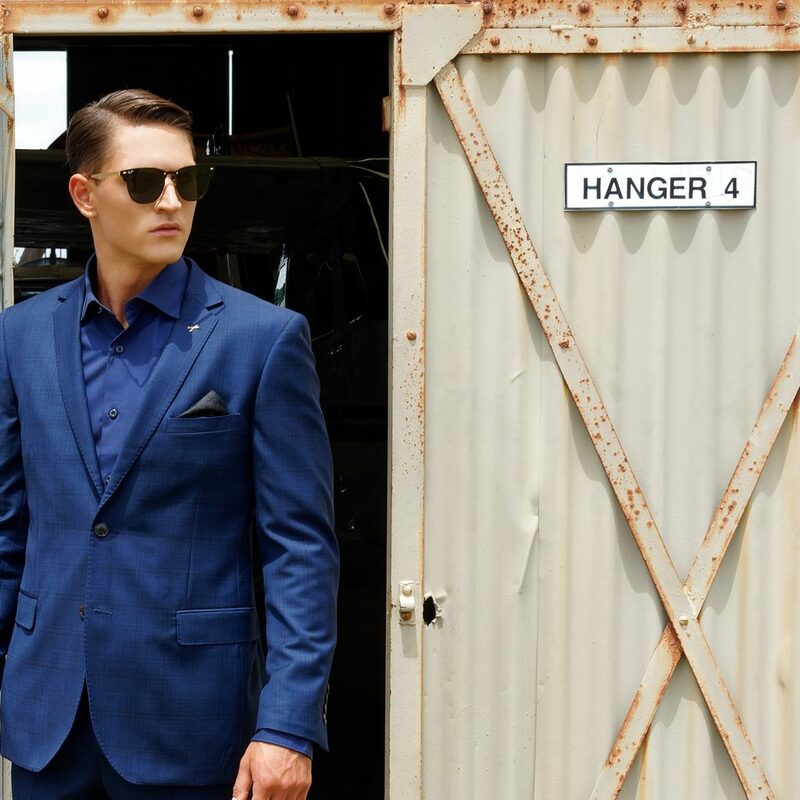 Just like a scene out of one of the Kingsmen movies, a dark coloured double breasted suit provides a strong silhouette , that while being classic, also conveys power and makes a statement. A more formal choice, perfect for an important business meeting. Alternatively, choosing a light, breathable fabric such as the New England Shilton Ivory linen suit would be the perfect choice for a Summer wedding or garden party. Liam wears Gibson Woodard Blue, Large Window Pane Double Breasted Suit and Brooksfield White Shirt with Theodore & Tux Pale Pink & White Stripe Tie, Ferracini Tan Shoes and Buckle Belt in Tan. Liam wears New England Shilton Ivory double breasted linen suit and Brooksfield Navy shirt with James Adelinis purple & navy patterned pocket square, Ferracini tan shoe and Buckle Belt in black. The monochrome trend has seen a rise in popularity recently, being a stylish go-to business choice for gents. The perfect look for taking you from the boardroom to the bar after work. When styling monochrome, remember to keep the visual interesting by applying patterns, textures and shades of colours. 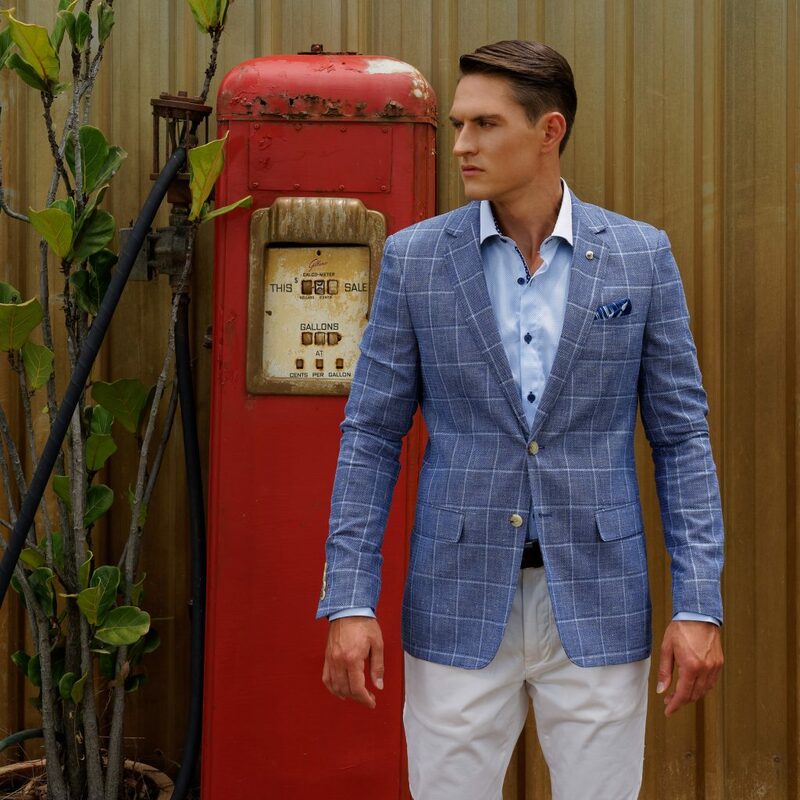 As shown in the Studio Italia Jensen suit a subtle check and slight change in colour tone to differentiate from the shirt underneath can make for a striking visual and stylish outfit. Liam wears Studio Italia Jensen suit in grey and Calvin Klein grey shirt with Florshiem Dalton black shoes and Buckle Belt in black. Liam wears Studio Italia Jensen suit in navy and Brooksfield Navy shirt with Collezione Black Paisley pocket square, Florshiem Dalton black shoes and Buckle Belt in black. Put a finishing touch on any outfit with an eye catching accessory. Small personal touches help you stand out and be unique, while adding interesting detail to your outfit. Make a statement with one of these Feather lapel pins or add some colour and intrigue with a pale pink and blue stripe bow-tie from James Harper. Liam wears Joe Black Captain Navy Check Suit and Studio Italia light blue shirt with James Harper Pale pink & blue stripe bow tie, Florshiem Dalton Black shoes and Buckle belt in black. Liam wears Cambridge Beaumaris Sports Coat, Wolf Kanat Topsky chino black and Wolf Kanat pale pink shirt, with James Harper Feather lapel pin, Florshiem Stratus black boots and Buckle Belt in black. 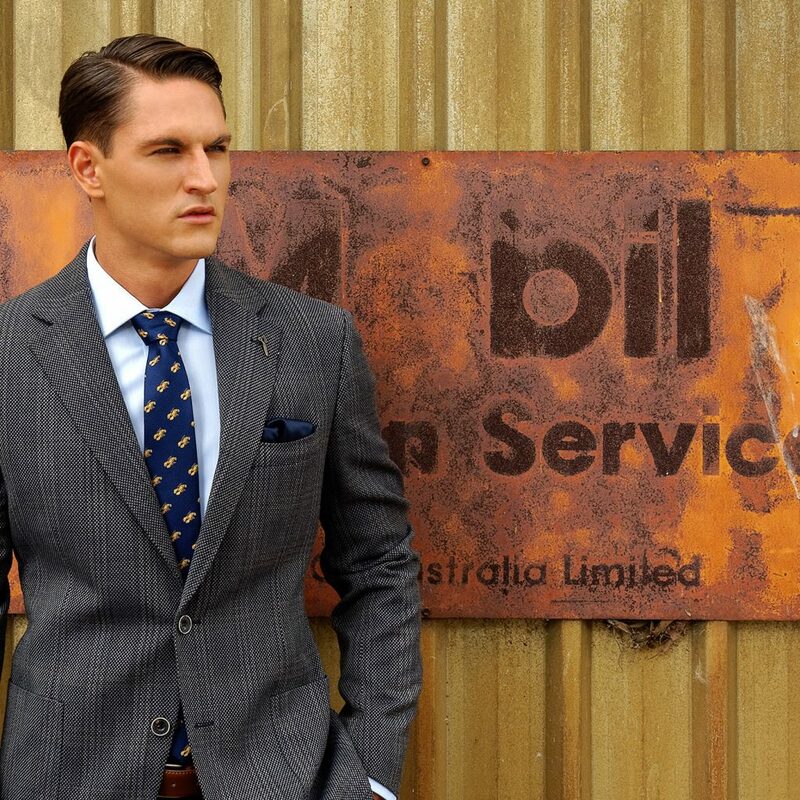 Powerful, elegant and flattering: a sports coat is a must for every gents wardrobe. Balance smart and casual with this great garment by dressing it up with a tie or leaving it open-collared for a more casual look. The New England Axel Sand linen sports coat paired with an open-collared Brooksfield white shirt is the perfect example of when casual can be classy. Liam wears New England Axel Sand Linen Sports Coat, Wolf Kanat Topsky Chino black and Brooksfield white shirt with Ferracini tan shoe and Buckle Belt in tan. 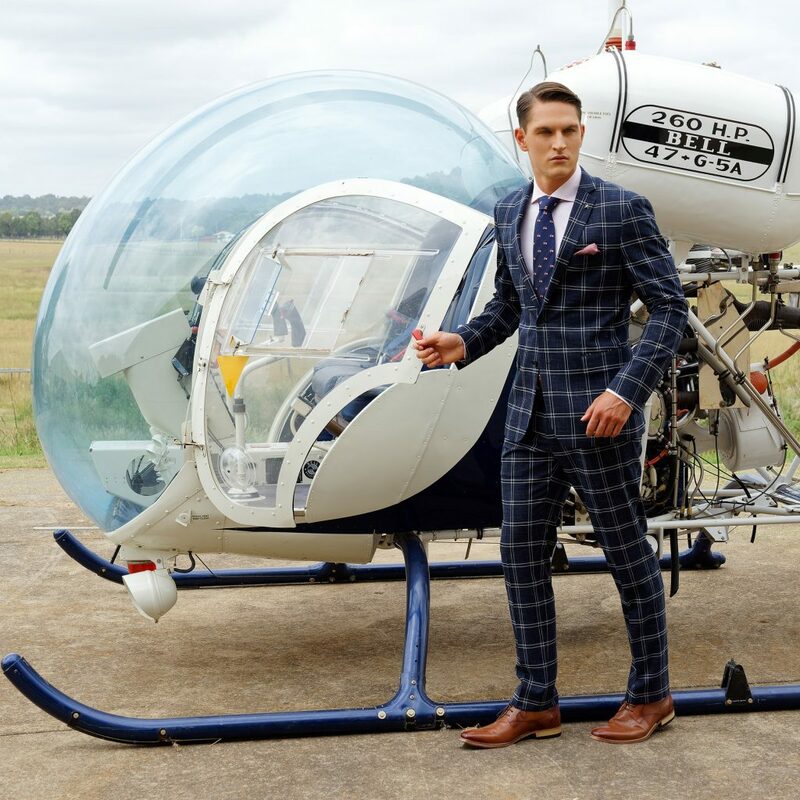 Liam wears Joe Black Cruise sports coat, Wolf Kanat Lenningrad Ink Trousers and Studio Italia light blue shirt, with a James Harper Navy Lobster Print tie, Collezione Navy pocket square, Ferracini tan shoe and Buckle belt in tan. 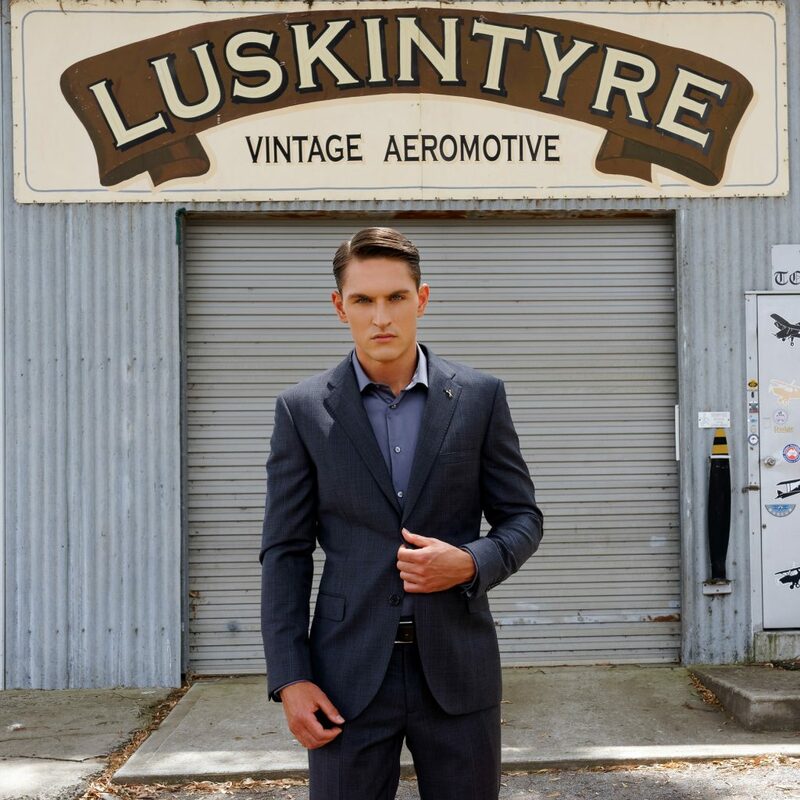 We hope you have enjoyed our men’s style guide: viewing The Luskintyre Collection. We look forward to helping you with your menswear needs. Visit us in store at 767 Hunter St, Newcastle West or to book an appointment click here or call 4940 8382.